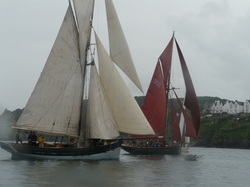 Fowey Classics use the Old Gaffers Association (OGA) handicap system. All boats which have participated in either the Triangulation Race or Trafalgar Cup since 2005 have been allocated an handicap figure by Fowey Classics and do not need to complete the handicap form. First time entrants and boats which have not participated in Fowey Classics since 2004 are required EITHER to submit their OGA handicap figure (if they have one issued by a recognised club or organisation) OR complete the downloadable handicap form (comes with the entry form) and return it with their entry form. Please note that the measurements on the handicap form are required in traditional feet and tenths of a foot. Fowey Classics will not accept any measurements (or other measurement document) which gives dimensions in metric format.